One subject that I keep on reading about that particulary distresses me is the subject of-and I'm not even joking here-hermaphrodite polar bears. It appears that toxic waste and chemicals have caused some of our friends up North to develop new reproductive organs. These body-altering chemicals are called endocrine active substances (EAS) and many are a result of human activity. As humans continue to pollute the earth, the animal world is feeling the effects. It's not only polar bears that are becoming hermaphrodite, many Artic animals are in danger including seals, whales, and reindeer! 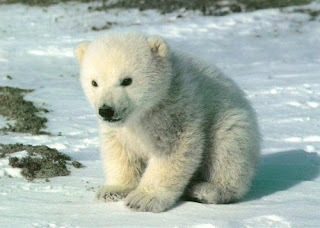 Why are Artic animals particulary at risk? Because they have high levels of body fat and long life spans, which means they absorb a lot of toxins (mercury, cadmium, etc) for a long period of time. Also, the climate is freezing and there is no soil to absorb the pollution. How does this relate to evolution? Well, clearly these bears have undergone a mutation, and in a way adapted to their environment. Will they continue to mutate, or will they die out? Will other animals become hermaphrodites? What about humans? Due to environmental and lifestyle factors, the human male sperm count has been steadily decreasing. Will there come a day when men and women will no longer reproduce? Maybe in the future, humans will also mutate and become hermaphroditic...unless we stop polluting! Wher eis the real evidence that those pollutants are really the cause of hermaphrodism? I do believe that pollution and organic compounds are quite bad but I would like to see some evidence or a link to that evidence....can you search it and edit this post? I found quite a few newpaper articles that cite a study in Svalbard, Norway. The study found that one in fifty female polar bears is now hermaphroditic. Flame retardants are the main pollution source resposible for the change. PS) What kind of bear can fit through a membrane?